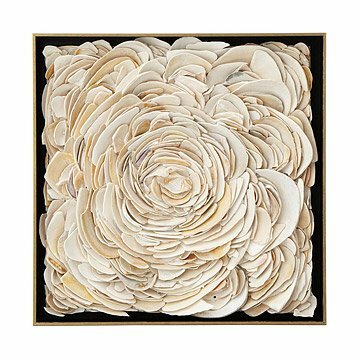 This framed beach art is a collage of sea shell fragments collected from the Hamptons in New York. Artist Valerie Carmet has taken the childlike wonder of picking up seashells at the beach, and transformed it into a sophisticated work of art. Carmet was particularly inspired by imperfect shells that are typically overlooked--naturally shattered by the churning of the sea into shimmering fragments. She hand picks these shells along the Hamptons beaches in New York, and carefully cleans them. She then carefully assembles them into a flower-like work of art that is part collage, part mosaic, part sculpture. The final creation is then mounted in a simple, floating metal frame, nicely contrasting the formal, man-made geometry of the frame with the organic and infinitely varied forms of the shells. The piece comes individually signed and numbered by the artist. Handmade in New York. Due to the reclaimed materials and handmade nature of this item, no two are alike and variance is to be expected. NOW SHE OWNS THE TRIO OF SHELL COLLECTION..LOOKS AMAZING!! Can't wait to give this gift!i know she will love it! Beautiful and unique. Well constructed--no concern of shells falling out.